The history of Islands of Adventure is easily one of the most fascinating of any theme park on the planet. As is often times the case, nearly nothing that is originally pitched for a park ends up in the final product. That said, we have covered extensively here at Theme Park University how DC Comics would have been represented with Batman and Superman rides versus the Marvel attractions we have now among many other concepts. Today we examine the Harry Potter land that could have been at Islands of Adventure. 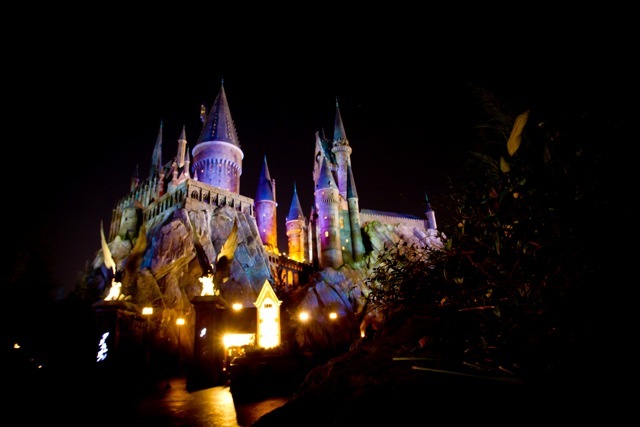 Negotiations between Universal Studios Parks and Resorts, J.K. Rowling and Warner Brothers lasted years before finally striking a deal everyone was happy with. There have been tales about how other theme park chains in the United States were also in negotiations for the exclusive rights, but we will leave that for another time. Believe it or not, the first pitch to bring the boy wizard to a Universal park had nothing to do with Islands of Adventure at all. 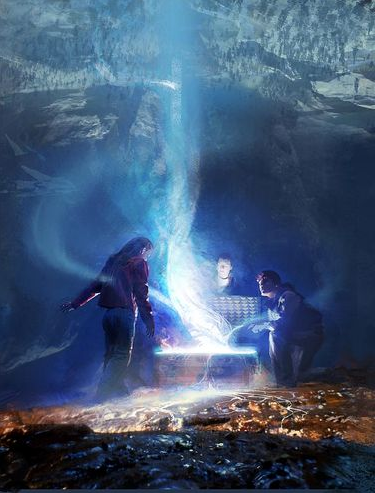 In keeping with the style of the books, we created an original story “Harry Potter and the Magic Talisman,” developing a storyline that featured all of the “touchstone” elements of the books, hopefully connecting with the growing body of fans of the Harry Potter books. I created a concept for a live show where Muggles were invited to Hogwarts for a special “open house” by the school for the parents of the students. As part of the day, a special “live stage show” was being presented with the cast made up of the students including Harry, Hermione, and Ron. The idea was that it would be simple “magic show” of sorts, allowing students to demonstrate some pedestrian things they had learned at the school. 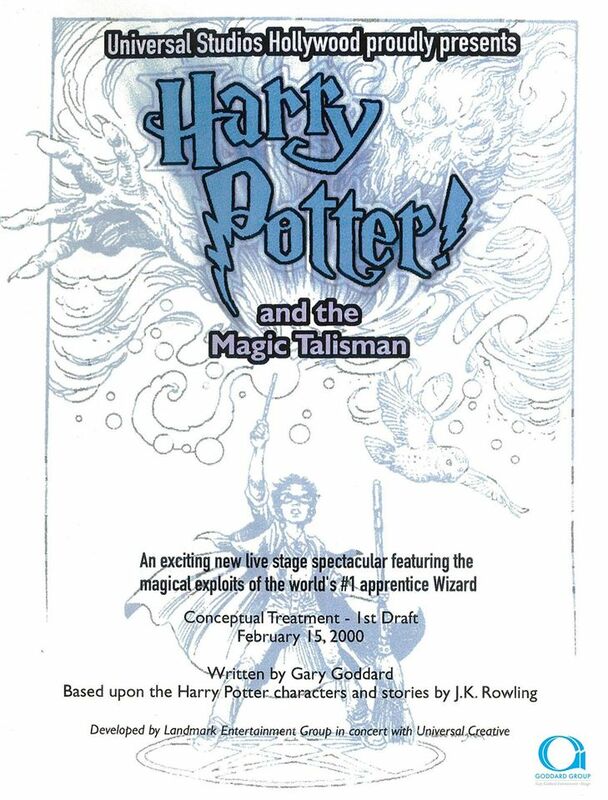 In addition to setting up the idea of a live show with magic, this gave us the chance to musicalize the Hogwarts School Song that was printed in the books, and it gave us the chance to create a new parallel/companion story to the books (at this point the movie hadn’t been made yet). Essentially our show included Harry’s Owl, the Hogwarts School song, Harry, Hermione and Ron uncovering something having to do with “he who must not be named” (and who ultimately IS named for sake of dramatic narrative) and who then shows up to wreak havoc on the school and the Muggles in attendance. The ultimate battle of magical powers builds in scale with Lord Voldemort taking control and culminating with the appearance of a multi-headed Hydra-serpent who is summoned (using the pre-existing elevator lift and shaft in the Conan Theatre) with our heroes using their broomsticks and wands to subdue it. Of course there’s a lot more to it, but that was the basic idea. Now remember this was all done in just three weeks when the Harry Potter phenomenon was just beginning – no movie out yet, just the books and the huge Potter fans worldwide. Bill Stout turned around several very cool black and white sketches that helped to convey the spirit of the show, and Greg Pro turned around a pretty nice color “finale” piece in record time as well. As a footnote to this story, I always wondered why we only had two weeks to do this. I found out that Universal has spent several months working on another concept, and that it was found wanting. With a meeting coming up for J.K. Rowling and/or Warner Brothers, they needed something else and they needed it quickly. Ultimately, Universal was told that they (J.K. and WB’s) preferred to wait until the movie came out before making any licensing deals for theme parks. A very smart move on their part. But actually, even now after all these years and with the movies now out, I think this concept holds up well for a live “spectacular” based upon the Harry Potter saga. 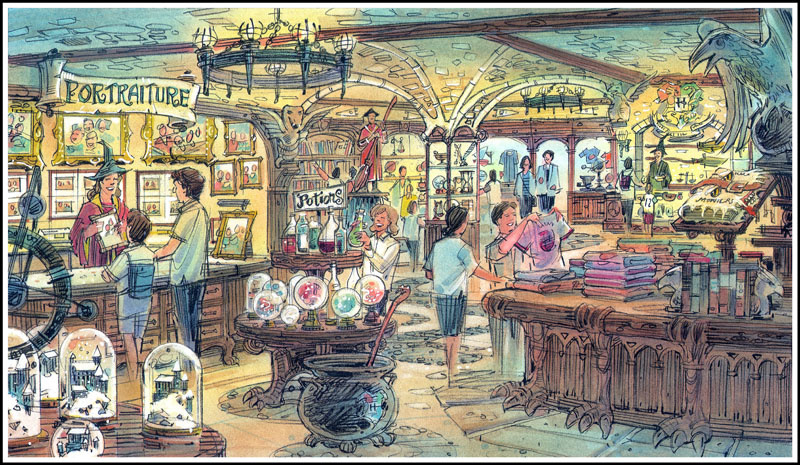 Ultimately, while the show sounds like it would have been pretty amazing, what we ended up getting was an entire Harry Potter land at Islands of Adventure, which includes rides, entertainment, and retail in addition to themed food and drink. As the focus of the project became bigger, there were still budgetary concerns on how to make this work in the footprint of an existing park. It is also worth noting that the concept art you’re about to see was done before the first movie was released. Meaning no one really knew what the movie version of Harry Potter’s world might look like just yet. 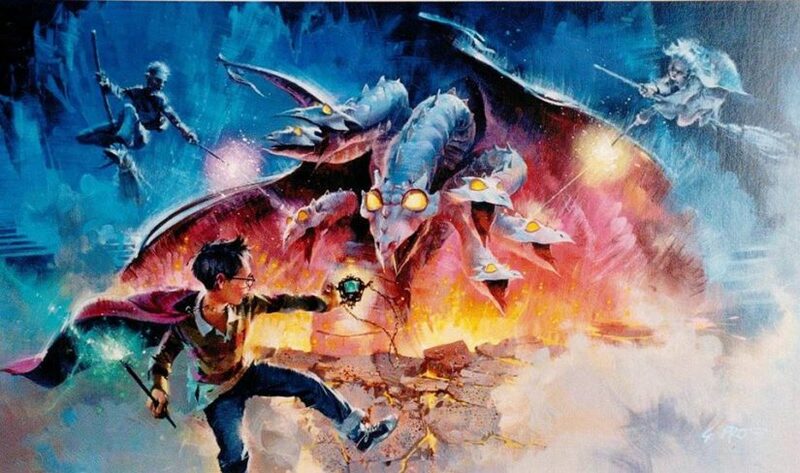 Early concepts showcased Harry Potter moving into the existing Lost Continent area, which it eventually did. However, some of the original concepts showcased the land being merely modified as opposed to nearly bulldozed. Notice the Enchanted Oak Tavern in the background, which was to be re-themed instead of demolished. One of the elements fans miss most from the original version of Lost Continent is the stone dragons that visitors had to pass through in order to queue up for Dueling Dragons. Seen above in this version, they would have been saved. Also worth noting is that Weasley’s Wizard Wheezes was part of this particular pitch, but did not open until Diagon Alley debuted in 2014. One of the brilliant aspects of the Wizarding World of Harry Potter is just how much their merchandise locations are a destination within the land, if not more so, than the attractions. 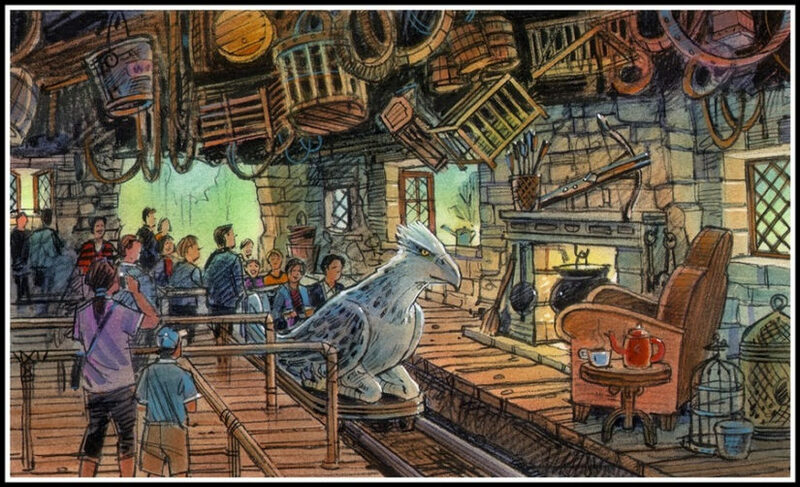 In the concept above, notice how the architecture and theming lends itself more to The Lost Continent than Hogsmeade. Keep in mind, this particular pitch was not to recreate Hogsmeade from the film or books, but an example on how to get the boy wizard into Islands of Adventure much quicker to capitalize on its popularity. One concept that did make into the final product was Hagrid’s Hut. Seen above, the idea was to modify the queue for The Flying Unicorn, which later became…. …. Flight of the Hippogriff! This utilized the same coaster trains, layout and the station was also modified. Even though the station turned out nearly identical to what you see today, there were some changes made between concept and final product. 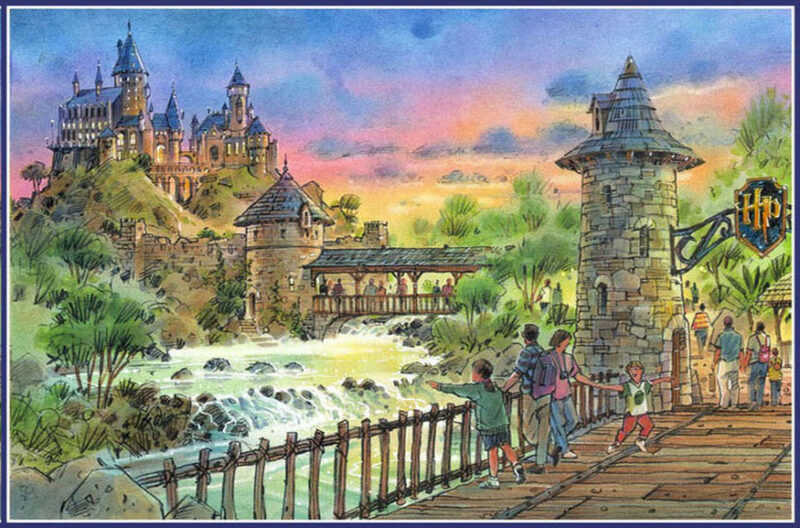 Finally, we have this incredible concept sketch of Hogwarts Castle before Hogsmeade was supposed to be part of the land. Notice the entrance runs across a bridge just above a cascading waterfall and doesn’t start immediately below the castle. 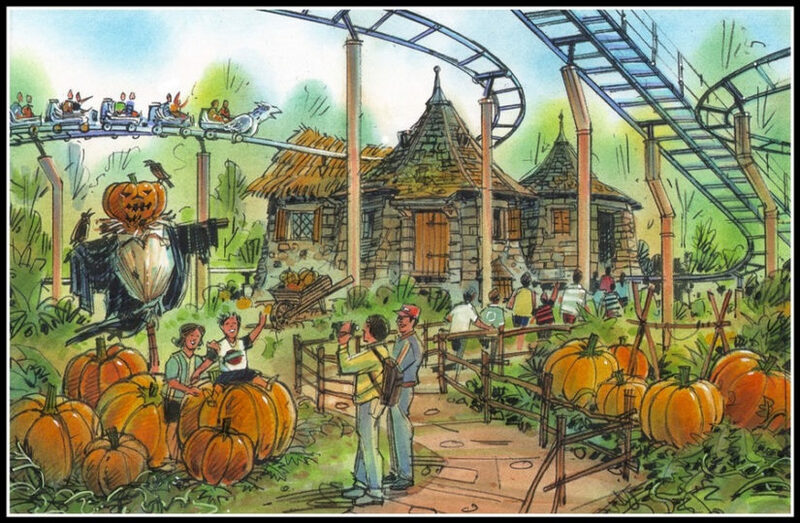 I’ve got about well over a dozen more concept sketches that eventually did make it into the park that I will share next time. Many of which have never been seen before. Stay tuned. This entry was posted in Universal and tagged Gary Goddard, Harry Potter, Islands of Adventure, J.K. Rowling, Warner Brothers. Bookmark the permalink. Trackbacks are closed, but you can post a comment.